Metallic nanomolecules capable of carrying drugs to exactly where they are needed could one day help to treat patients with a fatal lung condition. Scientists based at Imperial College London have tested a new type of nanoparticle called metal organic frameworks (MOF) – tiny metal cages less than 100 nanometres across that can be loaded with drug molecules – which they believe could potentially be used to treat patients with a devastating condition called pulmonary arterial hypertension (PAH). In PAH the blood vessels of the lungs constrict and thicken, increasing blood pressure and causing the right side of the heart to work harder and harder, until it eventually fails. The condition is rare but devastating and can affect people of all ages, including babies, young adults and the elderly. Patients in the late stage of the disease have few treatment options beyond transplant, with a mean survival time of around five years following diagnosis. While there is no cure for PAH, existing treatments work by opening up these blood vessels. These drugs act on blood vessels throughout the body, however, causing blood pressure to drop and resulting in a number of side effects – which means the dose at which these drugs can be given is limited. In their latest study, published online in Pulmonary Circulation, the multidisciplinary group at Imperial describes how it has taken the first in a number of steps to develop nanoparticles which could deliver drugs directly to the lungs, showing that the basic structures are not harmful to cells. 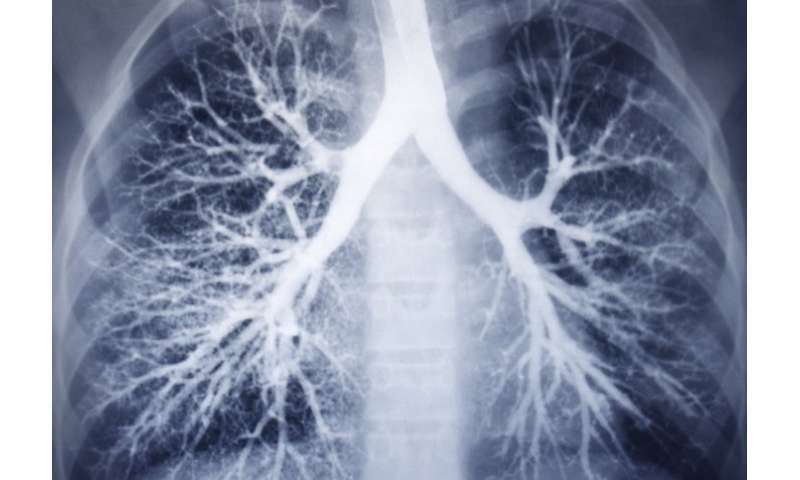 Professor Jane Mitchell, from the National Heart and Lung Institute at Imperial, who led the research, said: "The hope is that using this approach will ultimately allow for high concentrations of drugs we already have to be delivered to only the vessels in the lung, and reduce side effects. For patients with pulmonary arterial hypertension, it could mean we are able to turn it from a fatal condition, to a chronic manageable one." The tiny metallic structures – composed of iron – were made in the lab of Professor Paul Lickiss and Dr Rob Davies's, from the Department of Chemistry and by Dr Nura Mohamed during her PhD studies at Imperial. Dr Mohamed, who was funded by the Qatar Foundation, made the structures so existing drugs used to treat PAH could fit inside them. These structures were tested in human lung cells and blood vessel cells, which were grown from stem cells in the blood of patients with PAH. The team found that the structures reduced inflammation and were not toxic to the cells. Further tests showed that the MOFs were safe in rats, with animals injected with MOFs over a two-week period showing few side effects – other than a slight build-up of iron in the liver. "One of the biggest limitations in nanomedicine is toxicity, some of best nanomedicine structures do not make it past the initial stages of development as they kill cells," said Professor Mitchell. "We made these prototype MOFs, and have shown they were not toxic to a whole range of human lung cells." MOFs are an area of interest in nanomedicine, with engineers aiming to develop them as carriers which can hold onto drug cargo, releasing it under specific conditions, such as changes in pH, temperature, or even when the nanostructures are drawn to the target area by magnets outside the body. 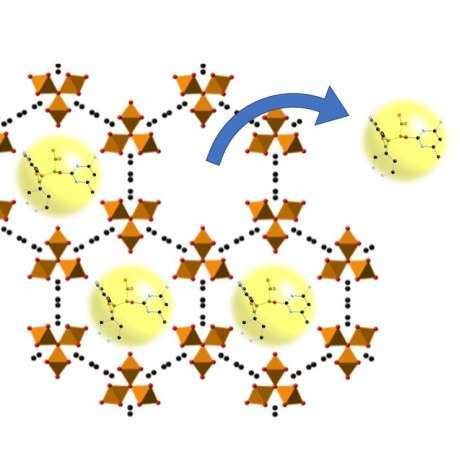 Beyond the finding that their iron nanostructures were non-toxic, the team believes the MOFs may have additional therapeutic properties. There was evidence to suggest anti-inflammatory properties, with the MOFs reducing the levels of an inflammatory marker in the blood vessels, called endothelin-1, which causes arteries to constrict. In addition, iron is also a contrast agent, meaning it would show up on scans of the lungs to show where the drug had reached. The MOFs have not yet been tested in patients, but the next step is to load the tiny metallic structures with drugs and work out the best way to get them to target their cargo to the lungs. The researchers are confident that if successful, the approach could move to trials for patients, with a drug candidate ready to test within the next five years. The MOFs could potentially be delivered by an inhaler into the lung, or administered by injection. "In this study we have proved the principle that this type of carrier has the potential to be loaded with a drug and targeted to the lung," explained Professor Mitchell. "This is fundamental research and while this particular MOF might not be the one that makes it to a drug to treat PAH, our work opens up the idea that this disease should be considered with an increased research effort for targeted drug delivery."